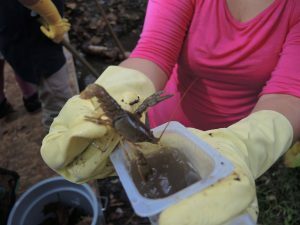 What better way to learn about stream ecology and water pollution than to collect and identify the fascinating insects, crayfish, and shrimp-like scuds living in streams? 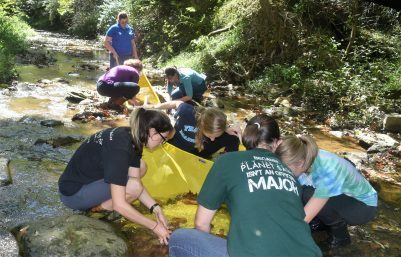 ICPRB provides presentations, hands-on activities, and resources to help teachers (middle through high school classes) start stream ecology or monitoring programs. The presentations can be done as a series or as stand-alone lessons. Bilingual lessons in English and Spanish are available here. This presentation can be used to introduce stream ecology and stream monitoring to students. The Cacapon Institute – The Potomac Highland Watershed School provides a game-like approach to learning about benthic macroinvertebrate identification and collection. Audubon Naturalist Society – Green Kids provides complete lesson plans and PowerPoints for grades 4-5, covering stream habitat, monitoring procedures, and equipment. 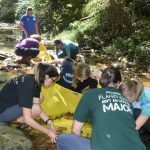 Izaac Walton League of America – The Creek Freaks Program provides comprehensive teacher and student guides for extensive hands-on inquiries of stream ecosystems for grades 5-8. Explore and Restore Maryland Streams, Maryland Department of Natural Resources Biological Assessment of Stream Health. A Guide To Common Freshwater Invertebrates of North America, J. Reese Voshell, Jr. – Covers life habits and basic anatomy, color illustrations.